[ Benjamin Disraeli, British Prime Minister. ] Autograph Signature ('B. Disraeli'). On 3 x 12.5 cm. slip of paper, cut from a document. In fair condition, on aged paper with light signs of damp. At bottom left and underlined, reading: 'B. Disraeli'. At top right is part of what appears to be the word 'Thos.' (for 'Thomas'). 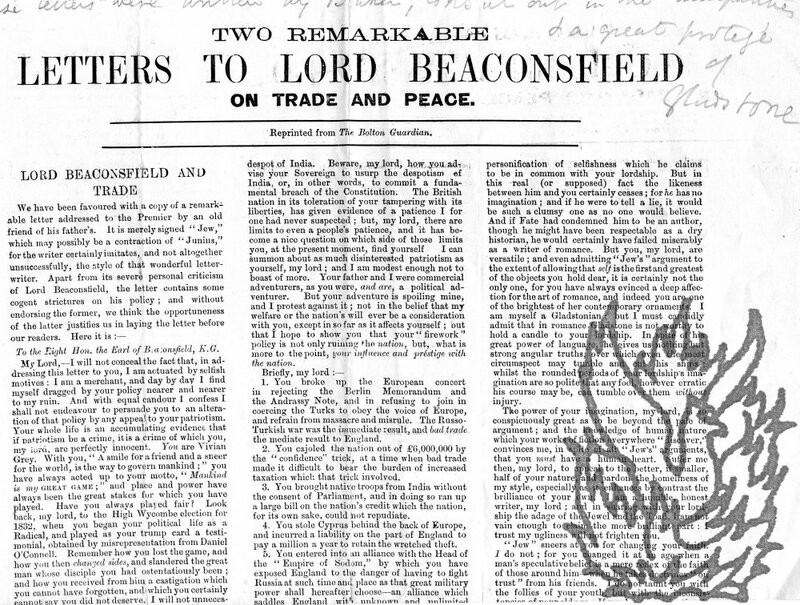 [Printed poster, attacking Benjamin Disraeli ('Mr. D'Israeli, junior') on his standing as Tory candidate in the Taunton By-Election of 1835.] Extract from the Sun, London Paper, Friday, 24th April, 1835. Printed on one side of a piece of 38.5 x 23.5 cm wove paper. In good condition, lightly aged and worn. An attractive political artefact and example of provincial printing, with the title on four lines as follows: 'EXTRACT | FROM THE | SUN, London Paper, | FRIDAY, 24th April, 1835.' The thirty-three lines of text, enclosed in quotation marks and with the first line in bold, begins: 'WE understand that Mr. D'ISRAELI, junior, has just set off post-haste for TAUNTON, in order to oppose Mr. LABOUCHERE'S RE-ELECTION for that Borough. A richer joke than this we have not heard for many a day. Quarto: 88 pp. Unbound and in worn original yellow printed wraps. On aged, discoloured paper, with last dozen leaves and back wrap with damage (by burn? ), affecting only a few words of text, but requiring repair. This copy addressed on back wrap to 'T C Haliburton Esq MP | Atheneum Club | Pall Mall' (Thomas Chandler Haliburton, 1796-1865). An uncommon item: COPAC only lists copies at Cambridge, Bristol, the National Library of Scotland and the British Library. Handbill entitled "Extract from "The Times" of 21st August, 1848. ", reproducing a petition to the House of Commons 'from Finnemoor', complaining of 'oppression on the part of the Bishop of Oxford' [Samuel Wilberforce, 1805-1873]. Quarto bifolium, 3 pp. Verso of second leaf blank. On greyish-blue paper. Good, though lightly creased and with a little spottting. Begins 'MR. D'ISRAELI [sic] presented a Petition from Finnemoor, a place forming part of Oxfordshire, but being wholly within the County of Buckingham. The Petiton complained of oppression on the part of the Bishop of Oxford. Autograph Letter Signed ('W. F. Monypenny') to Charles J. Trevor. 29 May 1907; on letterhead 2 Queen Anne's Gate, S.W. Two pages, 12mo. Good, on spotted paper. 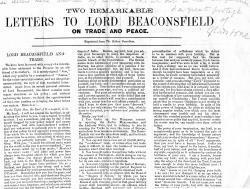 Folded twice.He is obliged to his correspondent for 'sending me a copy of the Disraeli letter in your possession'. He will not trouble his correspondent for a loan of the original 'as the contents are rather of private than of public interest'. Autograph Letter Signed ('A Black') to autograph hunter J. H. Hall. 12mo: 1 p. On recto of first leaf of bifolium. Good. Reads 'Sir | Mr. Gladstone having resigned the Rectorship of the Edinburgh University the Students have today elected Mr. Carlyle as his successor in opposition to Mr. D'Israeli [sic] -'. Two Autograph Letters Signed to Seymour Teulon. English judge and Tory politician (1816-88; DNB). Both letters 3 pages, 16mo, and both in good condition. Interesting letters giving his views on an important matter. A large quantity of letters. Baron Stanley of Alderley, statesman (1802-1869). 22 ALSs and ANSs (“S” or “Stanley”)and 1 AL, third person, 1-4pp., all 8vo except one (4to), to (S. Lucas), political journalist and author, mainly 1853, some undated or n.y., some not mentioning Lucas but almost certainly to him. Stanley is a contributor and more to a journal of which Lucas ispresumably the editor. Their brief, since Stanley was a Whig politician,was presumably to support the Whig cause. (See, however, the ALS toDisraeli described below.) He discusses the articles he is preparing or hasprepared (subjects including: J.W.